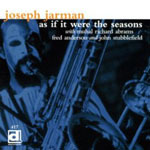 As If It Were The Seasons was Joseph Jarman's second album for Delmark records, following his 1966 debut, Song For. Recorded in 1968, it is a rare document of his artistry pre-Art Ensemble of Chicago. Remastered from the original analog tapes, this reissue sheds new light on a seminal free jazz classic. The album contained two extended compositions; each one filling a side of the original vinyl release. Side one combined the title track with "Song To Make The Sun Come Up," both exercises in restraint and dynamic variation. Accompanied by bassist Charles Clark and drummer Thurman Barker, Jarman alternates between a number of reeds for color and texture. Drifting through patches of meditative silence broken by skittering percussion and breathy supplication, the trio ascends to a cathartic release led by Jarman, who unfurls an alto sax solo bristling with tension and fury. As the storm subsides, under-recognized vocalist Sherri Scott materializes. Free jazz vocals are generally an acquired taste, but Scott delivers lyrical phrases with pitch control and subtle dynamics worthy of Sarah Vaughan. Blending notes and tones with élan, she dovetails with Jarman's alto as he soars upward with circuitous abandon. Sharing a moment of tender vulnerability toward the end, they float in unison over a haunting landscape of sinuous arco bass and scintillating percussion. Dedicated to the late pianist Christopher Gaddy, "Song For Christopher" occupied the second side and augmented the quartet with six additional musicians. Pianist Muhal Richard Abrams, and tenor saxophonists Fred Anderson and John Stubblefield would all go on to great acclaim. Flutist Joel Brandon is now best known for his unconventional whistling, but trumpeter John Jackson and trombonist Lester Lashley have unfortunately since faded into obscurity. Slowly gaining steam until the entire ensemble is in full swing, the episodic composition follows a dramatically unfolding arc. Expanding from a glacially rising vortex of sound into a gorgeous ascending melody, the group harmonizes on a buoyant line full of optimistic verve before tearing into a manic screed rivaling John Coltrane's Ascension (Impulse!, 1965) in density. In the midst of the fray, Abrams' kinetic piano assault sidesteps Anderson's brawny tenor explosions as the entire group erupts in testimonial cries. The collective climax ends abruptly, yielding a nuanced coda ripe with exotic timbres; Scott's ghostly vocalese drifts through a magical soundscape of Asiatic percussion before fading into the ether. In league with contemporaneous masterpieces like Roscoe Mitchell's Sound (Delmark, 1966) and Anthony Braxton's 3 Compositions of New Jazz (Delmark, 1968), As If It Were The Seasons continues to challenge and reward listeners almost four decades later. Track Listing: As If It Were The Seasons/Song To Make The Sun Come Up; Song For Christopher. Personnel: Joseph Jarman: alto saxophone, bassoon, fife, recorder, soprano saxophone; Charles Clark: bass, cello, koto; Thurman Barker: drums, percussion; Sherri Scott: voice; Muhal Richard Abrams: piano, oboe (2); Fred Anderson: tenor saxophone (2); John Stubblefield: tenor saxophone (2); Joel Brandon: flute (2); John Jackson: trumpet (2); Lester Lashley: trombone (2); All Personnel: bells, gongs, harps (2).